1 What Is A Spinning Reel? 2 What Are The Different Types Of Fishing Line? 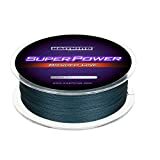 2.3 What Is Fluorocarbon Fishing Line? A great spinning reel is one of the most important investments an angler can make. Yet, in order for it to produce the best results, it must have the best fishing line for spinning reels. Fishing line has been around since 1667. The fishing lines in these times used catgut. Silk fishing lines began showing up around 1724. Fishing line has changed throughout the years. Let’s get caught up on the latest advancements! 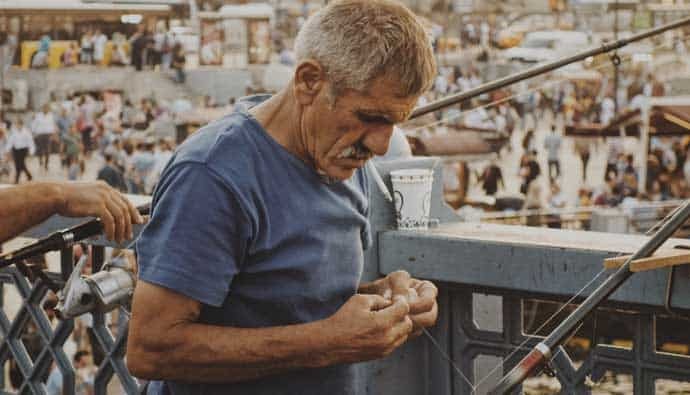 Through the years there have been many improvements to fishing line. This includes the popular monofilament fishing line (mono) and braided fishing line (braid). Let’s learn about which type of line is best for spinning reels! Before we get started talking about the fishing line, let’s first talk about what is a spinning reel? There are several different spinning reel sizes to accommodate the type of fishing you want to do. Spinning reels have a fixed, open-faced spool positioned in line with the surf fishing rod. The spool is stationary and a rotor/line guide revolves or spins around the fixed spool. This type of reel mounts below the rod and held in the right hand. The reel’s crank turns the left hand, although most models come with the ability to reverse the handle. Spinning reels can handle line weights as low as a 2-pound test, and can cast very light lures when matched with the proper rod. Larger models are for bigger fresh and saltwater species and can handle the thicker line. All reel spools have a line capacity, which will help you decide on which reel to select. This information is on the spool. Why would you use a spinning reel instead of a conventional reel? Spinning reels have fixed spools while conventional reels have spools that release or spin when casting. Here’s what a spinning reel looks like. Spinning reels are more user-friendly, especially for beginners and children learning to cast. Spinning reels do not tend to backlash or tangle easy, and some anglers prefer the way they cast over conventional reels. The braided line was one of the earliest types of fishing line. It’s popular because of its high knot strength, lack of stretch, and great power in relation to its diameter. Braids from natural fibers such as cotton and linen. Natural fiber braids have changed to man-made materials like Dacron, Spectra or micro-Dyneema. Braided fishing lines have low resistance to abrasion, sharp objects can cut braided line. Their actual breaking strength will well exceed their pound-test rating. Braided lines often have 1/3 to 1/4 the diameter of mono or fluorocarbon lines at a given test breaking strength. Thus, it is easy to fit much longer braided line on a spool than monofilament or fluorocarbon line for the same strength. This is very important for deep sea fishing since reels don’t have to be very big to accommodate long lines. Also, thin braided lines provide less resistance to sea currents. Braided lines have very little stretch. This makes fishing rigs very sensitive to fish bites. This is important for both deep sea fishing and when targeting fish with a gentle bite. Due to the minimal stretch of braided line, hard-hitting fish will cause the line to break. Thus it is very important to set the drag on reels on very low values. Braided fishing lines are very flexible and can be easier to cast long distances. Braided line floats, and as such, is a common choice for topwater rigs, etc. One drawback of braided lines is that they are visible in the water, and therefore visible to fish. Many anglers attach monofilament or fluorocarbon line to the end of their braid line to serve as a leader and to reduce the braid’s visibility. Braided lines, particularly the newer synthetics, work on most types of fishing reels. 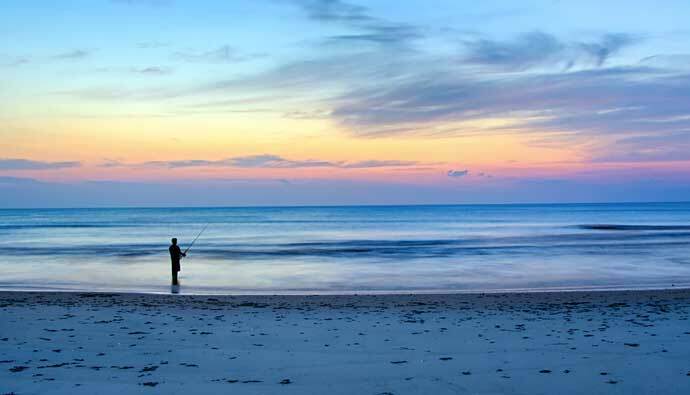 They make excellent lines for baitcasting reels and for trolling on the ocean. If you’re looking to cast far, especially from a jetty, try using braid instead of mono or mono topshot. As its name implies, monofilament fishing line “mono” is a single strand of material. Unlike multi-filament lines, which are strung from fused, braided or bundled together strands. Monofilament comes from different materials, the most common being nylon. Blending different varieties of nylon together into co- and multi-polymers produce different characteristics. This includes levels of stretch, strength, and abrasion resistance. Easy to handle. Thanks to its flexible nature, the monofilament is easy to use and works well for many fishing situations. This flexibility often described as limpness makes mono more manageable and easier to cast than stiffer lines. Stretch. Mono stretches more than superlines and than fluorocarbon, which gives it a forgiveness factor other lines can’t match. If your drag sticks or you set the hook too hard, mono compensates by stretching up to 25 percent or more. 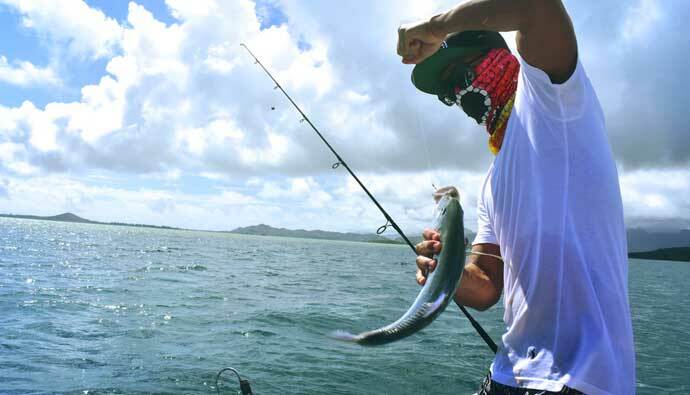 By stretching under pressure, mono also helps prevent your hook from tearing a hole in a fish’s mouth. This makes it easier for the fish to come unbuttoned. This is a factor both on the hookset and during the fight, especially when you’re dealing with big fish in close quarters. For example, many top bass pros prefer a beefy mono like Berkley Big Game over superline for pitching jigs. Shock strength. Stretch should not shock strength, which is a fishing line’s ability to absorb energy. Shock strength comes into play when your line has to withstand the sudden impact of a hard hookset or a big fish thrashing at the boat side. Sink rate. Thanks to its near-neutral buoyancy, mono sinks, making it a great choice for topwater lures. This suspended subsurface presentations where you don’t want to hasten the bait’s downward movement. Color palette. Mono is easier for manufacturers to tint than other types of line, so it’s available in a wider range of colors. You can choose from stealthy, low-visibility options such as green, blue or clear. Spin the color wheel the opposite direction and spool with high-vis shades perfect for line-watching presentations. Some monos, like Berkley Trilene TransOptic, offer the best of both worlds. By changing color from bright gold in sunlight to low-vis clear below the surface. Ease of use. Thanks to a combination of manageability, stretch, easy knot tying and other features, mono is the best ease of use fishing line. A great choice for first-time anglers or seasoned veterans utilizing needing specific techniques. In the fishing world, it’s associated with polyvinylidene difluoride (PVDF for short). It’s extruded in a single strand similar to nylon monofilament. But because fluorocarbon molecules are more tightly packed, the line is denser and noticeably heavier by size. It also differs from invisibility, stretch, and durability, all of which affect how it performs in the water. Low visibility, one of fluorocarbons biggest benefits is it’s nearly invisible underwater. This is because it does not distort light passing through the line (it has the same refractive index as water), and it’s a huge factor in clear water and when targeting skittish fish. Abrasion resistant. Fluorocarbons low visibility characteristics allow anglers to use stronger pound test lines in situations such as heavy cover tactics for bass. The abrasion resistance gives pros comfort fishing the thickest cover or dragging baits along the bottom. Sensitivity. Fluorocarbons packed molecules transfer more energy than mono. This results in better feel from the other end of the line, such as light bites or your lure ticking bottom. Also boosting sensitivity, fluorocarbon sinks faster than mono, resulting in less slack or bow between the lure and rod tip. The right line can be the difference between bringing in the fish and losing it. Toughness. Fluorocarbon is more abrasion resistant than standard nylon monofilament of the same diameter. Plus, while the sun’s harsh ultraviolet rays weaken nylon over time, fluorocarbon shrugs off UV with no ill-effects. Waterproof, unlike mono and some superlines, fluorocarbon does not absorb water. This means it has the same strength, sensitivity, and handling below the surface as it does when dry. It feels and acts the same on your first cast as it does on your last. Hooking power, lacking the low-end stretch of nylon mono, fluorocarbon delivers more solid hooksets, even at long distances. If you need to drive the hook home at the end of a long cast, this is a key consideration. Diameter, fluorocarbon is about the same diameter as nylon monofilament of the same break strength. Because fluorocarbon is hard for fish to see, upsize the pound test for extra strength and abrasion resistance, without spooking line shy fish. When spooling a spinning reel, note which way your reel bail turns;. Hold your empty reel the way it would be oriented on your fishing rod and turn the handle as you would when retrieving. Note the way the bail turns. This is the way the line will be spooled onto the reel; the opposite direction is the way the line will peel off the spool when you cast. Spinning reels are designed to hang down from the rod, not rest above it like spin casting and baitcasting reels are. Hold the reel when it’s not mounted on the rod, wrap the fingers of your casting hand around the mounting bar and let the reel hang from that hand while reeling with your other hand. Note which way the line is wound on the filler spool. You want to orient the filler spool so that line peels off it in the same direction. Your reel bail turns when you turn the reel handle, in other words, that it comes off the filler spool the same direction in which it winds onto the reel. Tie the end of the line to your reel spool. Use either an arbor knot or a uni-knot. If you wish, you can mount your reel on the rod and thread the line through the guides before attaching it to the rod. Begin reeling the line onto your reel spool. Turn the crank handle slowly with your cranking hand. You can add tension by passing the line between the fingers of your casting hand, by raising the rod slightly if your reel is on the rod, or by both methods. If you’re filling the reel by yourself, place the filler spool flat on the floor and let the line spool off it onto the reel. If you have an assistant, have the assistant thread a pencil or dowel through the filler spool, holding it parallel to the direction of the reel spool. The assistant can apply finger pressure to the spool to supply tension to the line. Check the line for twist after cranking a few times. If you’re taking up the line on the reel spool the same way it pays off the filler spool, you should not have a twist. You should still let the line go slack to check for twist. If there is a twist, the line will start un-spooling from the reel spool. You then have to peel off the line, flip the filler spool over, and start again. Continue filling the reel spool to within 1/8 inch (3.2 mm) of its rim. Your reel may have a tab or mark on its spool that lets you know when you’ve filled it to the proper amount. If you underfill the reel, your casts will be shorter because of the friction of the line rubbing against the top flange of the reel spool. If you overfill the reel, the line may absorb enough water when it gets wet to slip past the flange and cause a backlash when you cast. Cut the line off the filler spool when finished. You may want to put a rubber band around the reel spool to keep the line in place if you’re not going to fish with the reel right away. At the end of the article you’ll be ready to pick a line and go out to watch this sunset. Release the winding mechanism of the reel so that the line can unspool. The method of releasing the line varies depending on whether you’re using a spinning, baitcast or spincast reel. For a spinning reel, open the bail wire so the line can unspool. Baitcast and spincast reels depress and release with the large button on the back of the reel. Feed the “tag” or free end of the line through the first “eye” or line guide. You may need to apply a small amount of pressure on the spool of the reel to prevent the line from overrunning and becoming tangled. Pass the line through each of the eyes. As you do, always hold it with one hand to prevent the line from sliding back through the eye. Pull the line through the guide at the tip of the rod, leaving 3 to 4 feet of line extending from the end of the rod. This gives you enough line to work with when you tie on lures and hooks. Engage the winding mechanism to prevent the line from unspooling. This involves turning the handle of the reel forward, which engages the mechanism. Grip the rod with your casting hand around the reel seat. Put your index and middle finger ahead of the reel and your other 2 fingers behind it. Unlike spincasting or baitcasting reels, spinning reels reel with the hand opposite the one used to cast with. As most fishermen cast right-handed, most spinning reels have the handle on the left. Spinning rods are also longer on average than spincasting rods. Without a recessed seat and with the guide nearest the reel seat somewhat larger than the other rod guides to permit the line to flow more when you cast. Reel in until your bait is 6 to 12 inches (15 to 30 centimeters) from the rod tip. If you have a sinker or bobber attached to the line, it should be 6 to 12 inches from the rod tip instead. Crook your index finger to pick up the line ahead of the reel and press it against the rod. Open the reel bail. The bail is a loop of wire on the rotating rim outside and behind the reel spool. It gathers the line when you reel in and deposits it on the spool. Opening it moves it out of the way of the line so you can cast your lure. Swing the rod back past your shoulder. Sweep the rod forward, releasing the line as you extend your arm. To help you target your bait to the casting area, point your index finger at the place you want to release the line. You may find this technique difficult at first. 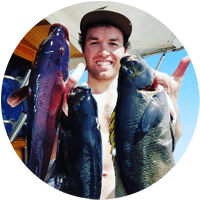 If you are casting with a long-handled spinning rod of the kind used in saltwater fishing, you’ll want to use your reeling hand as a fulcrum from which to pivot the rod as you cast. Reel the line in until your bait or lure is 6 to 12 inches (15 to 30 centimeters) from the rod tip. If you have a sinker or bobber attached to the line, it should be 6 to 12 inches from the rod tip instead. Grip the rod behind the reel with your thumb resting over the reel spool. Baitcasting rods are the same as spin casting rods. Most fishermen cast with the same hand they retrieve with, so if you prefer to hold the rod behind the reel when you retrieve, you’ll need to switch hands when you cast. You may want to rest your thumb at a slight angle on the spool instead of pressing the very flat of it on the line. This will give you more control over the flow of the line during the cast. Turn the rod so the reel handles point up. As with spincasting gear, this lets you use your wrist when you cast. If you cast with your opposite hand, the handles should point down. Press the reel spool release button. Baitcasting reels made since the 1970s have a mechanism to disengage the reel spool from the handles. They don’t turn during the cast, allowing for longer casts. The first such models had the button on the side of the reel. Most models today feature a release bar behind the spool that you press with your thumb when you rest it on the reel spool. You need to bend your casting arm at the elbow so that the crook of your arm begins to approach a right angle. As you do, raise your rod until its tip goes past vertical. This will give you the correct positioning to send the line out. Sweep the rod forward until it reaches eye level. This is about 30 degrees above horizontal or the “10 o’clock” position. As you do so, lift your thumb off the reel spool enough so that the weight of your bait or lure pulls line off the spool as it propels toward the target. 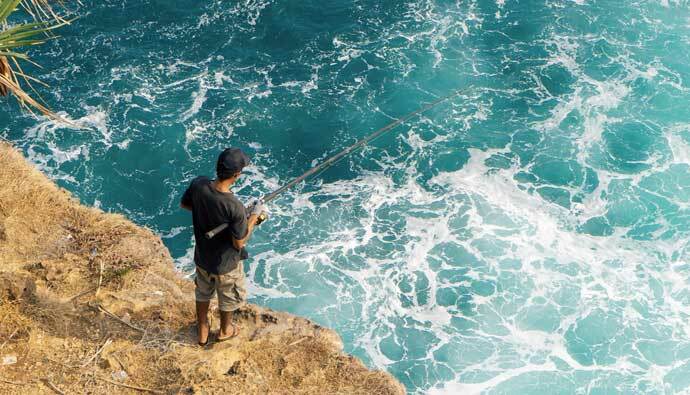 If you are casting with a long-handled baitcasting rod of the kind used in saltwater fishing, you’ll want to use your opposite hand as a fulcrum from which to pivot the rod as you cast. Press down on the reel spool with your thumb to stop the bait when it reaches the target. Pressing the button on a spincasting reel to “brake” the line. Not applying your thumb soon enough leads to the spool continuing to turn after your bait hits the water, creating an overrun or “birds nest”. You’ll have to straighten out before you can retrieve your lure. Incorporated strands in KastKing SuperPower Braided Lines allow you to tie a more solid knot and you can even tie an improved clinch knot. A special proprietary treatment (without a waxy coating) allows the supple fishing line to zip through the guides to your target and gives you better lure swimming action. Low memory helps you achieve a better, farther casts, less chance of wind knots. The greater abrasion resistance of KastKing braided fishing line decreases the likelihood of losing your “big one”! KastKing SuperPower Braid line’s powers are…super! Ultra high sensitivity and zero stretch for superior hook setting that increases your catch ratio. Smaller diameter compared to other brands allowing you to spool more fishing line on to your reel. Whether you are fishing freshwater or saltwater, surf fishing, ice fishing, trout fishing or bass fishing, you can count on KastKing braid to become your next favorite braided fishing lines. Stronger breaking strength than listed in the specifications. Can lose its dye quickly. In the 500-yard spools, quality control is poor. The dye can leave residue on your fishing equipment. Extreme fighting power for bigger fish. Berkley Trilene big game is super strong, with incredible strength for confidence and control. 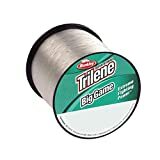 Extra Tough and Abrasion Resistant, stays tough against rough or sharp objects, makes Berkley Trilene the best monofilament fishing line. One of the most popular monofilaments in North America due to its incredible strength, reliability, and value. Extreme fighting power for big game fish, saltwater or freshwater. Easy to work with when spooling. Low test weight stretches very easily. The low stretch makes KastKing FluoroKote Fishing Line a great upgrade from the mono line. It’s an ideal low-cost alternative to fluorocarbon line. The combination of the two materials maximizes the advantage of fluorocarbon invisibility in water. 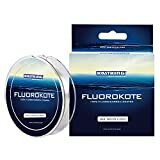 The diameters of the FluoroKote are less than KastKing Copolymer Fishing lines or other monofilament lines. Thus resulting in a smaller, stronger line that gives you more reel capacity and increased depth with diving baits. KastKing FluoroKote Fluorocarbon fishing line sinks faster with low absorption. The unique fluorocarbon materials make the line durable and offer knot strength, and exceed in sensitivity. KastKing FluoroKote Line is versatile, giving anglers piece of mind to fish almost any conditions and techniques with confidence. Not good for topwater use due to the high-density line sinking quickly. Can stretch to the breaking point very easily. Thin diameter means Piscifun lunker braid is the best-braided fishing line for tensile strength. Piscifun Lunker braid has very little to no spool memory and does not untwist like mono. 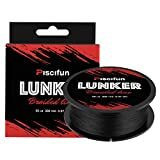 Unique finesse Netherlands PE fiber with utilizing coating make the Lunker braid a thin diameter that stands up to abrasion. Thanks to its zero stretch, Lunker braid transmits information from your lure better than any other type of fishing line. Lunker braid slices through vegetation like a knife when fighting fish. Does not loose dye like other braided fishing lines. Very rarely any inconsistencies in the line. Very easy to tie, holds knots well. When the line heats up in the sun it can become sticky. Can break easily under minor abrasion. CXX X-Tra Strong is the strongest fishing line as well as the toughest, most shock resistant line on the market. If you’re looking to throw into a nasty cover for largemouth, battle huge tuna with your drag locked down to some ridiculous setting, or pull plugs for monster salmon in a raging river, there is only one line to trust. Tournament anglers and guides alike choose CXX because of the abrasion resistance and it’s high strength to diameter ratio. And with 5 colors to choose from, you’re certain to have the perfect shade for any condition. More anglers prefer clear line than any other color, which made CXX X-Tra Strong in the Crystal Clear color a natural choice. Perfect for any water condition. The HI-VIS Clear Fluorescent line performs under some technique specific conditions, such as night fishing. Under a black-light or when an angler must watch the line to detect strikes (flipping and drift fishing). Salmon and steelhead fishermen along with tournament bass anglers prefer the stealthy, translucent moss green color. Smoke Blue gives anglers the opportunity to match specific saltwater conditions. The bright fluorescent green line meets the demands of anglers who need to manage their line while out on the water. Breaks at a much higher tensile strength than advertised. The line is smooth, casts farther than others of equal size. The color allows the line to be more invisible to fish in the water. For long casts, too much line stretch to get a good hook set on jigs, swimbaits, and Texas-rigged plastics. The more line you have out the less sensitive it is to less aggressive strikes. Can backlash very easily in spinning reels. There are many different types of fishing lines available, in this article, we have covered some of the top rated fishing lines. Out of the brands we have covered, we feel the P-Line CXX-Xtra Strong Fishing Line Is the top brand. The p-line is very strong and works well with most lures, and is very durable. It is a good idea to keep a check on your fishing line, look for signs of wear and abrasion. When in doubt, go ahead and add a new line. The best fishing line vs a lower quality can mean the difference between the one you bring in and the one that got away. Q: Who makes the best fluorocarbon fishing line? Q: What is a spinning reel? A: A spinning reel is a cylindrical device attached to a fishing rod used in winding and stowing line. Modern fishing reels usually have fittings aiding in casting for distance and accuracy, as well as retrieving line. Q: What is the best size line for bass? A: 10-20 pound test. When it comes to bass, even a two pound bass can exert up to eight pounds of pressure on your line. Q: When do you use braided line for bass? A: Braid works best when dealing with a lot of cover that can cause abrasion. Q: What is the ideal pound test fishing line? A: 15-pound test is a good choice if you are not sure what you will be fishing for. Q: What is the best type of fishing line to use? A: If you are going to be fishing in cover, say for bass braid is the best fishing line for bass. This is because the are usually found in deep cover where abrasion can affect the strength of your line. Mono is a good choice for most other species where the heavy cover is not an issue. 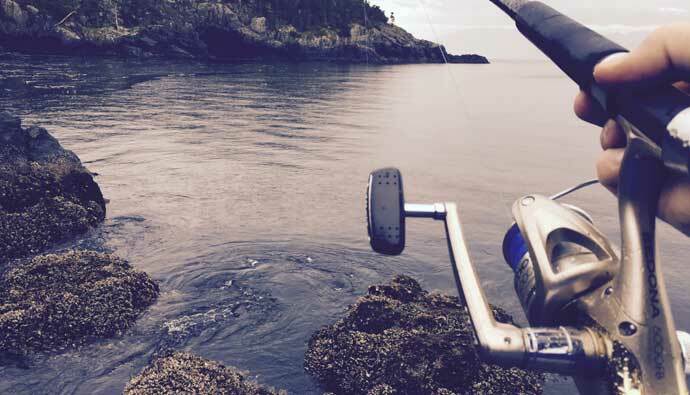 Q: When do you use a spinning reel? A: A spinning reel is a good starter reel for a less experienced angler because they are very user friendly. Small creeks and ponds are another place to use spinning reels. Q: Why does fishing line get tangled up when I cast? A: This can be due to the line being spooled too loose on the reel, it can also be due to allowing too much line to feed out on the cast.